There are nearly as many travelers as there are pairs of feet, but there are not two in a thousand who contrive to put into a record of their wanderings the very color and vividness of impression which place and people have left upon them. Jan and Cora Gordon, English artists, spent a summer and autumn in the hill towns of Eastern Spain, Murcia, Alicante and Verdolay. 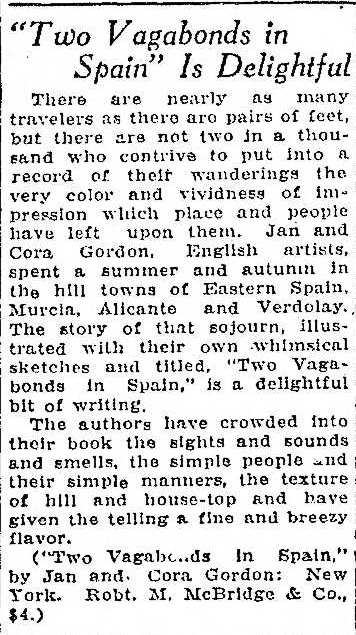 The story of that sojourn, illustrated with their own whimsical sketches and titles, "Two Vagabonds in Spain," is a delightful bit of writing. The authors have crowded into their book the sights and sounds and smells, the simple people and their simple manners, the texture of hill and house-top and have given the telling a fine and breezy flavour." This book was the start of the celebrated "Two Vagabonds in .." series produced by the Gordons. 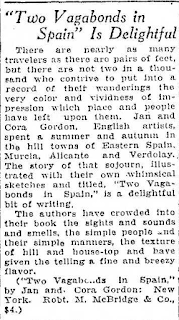 "Two Vagabonds in Spain" was the title given to the American issue of "Poor Folk in Spain" 1922.